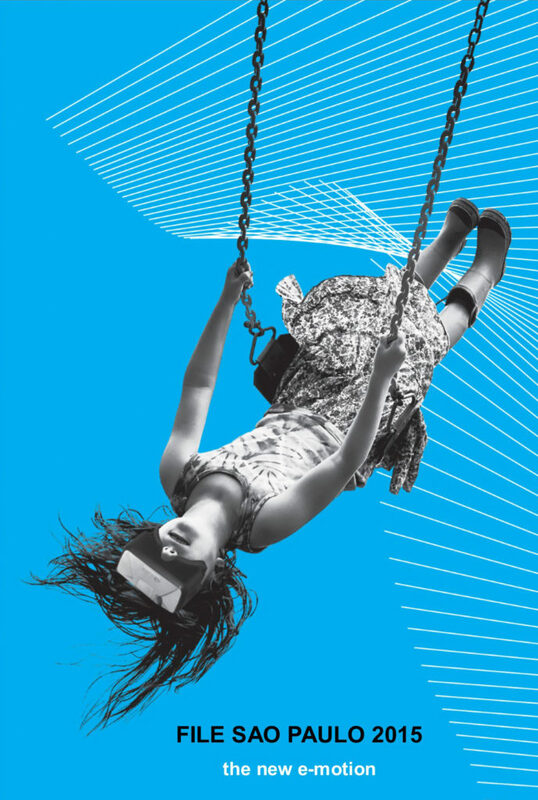 FILE 2015 – Electronic Language International Festival takes place this year from June 16th to August 16th at Centro Cultural FIESP – Ruth Cardoso. In its 16th edition, the festival occupies the Art Gallery of SESI-SP, the Digital Art Gallery (the facade of the FIESP building) with the FILE LED SHOW, and the Mezzanine Floor, where a series of workshops takes place. The festival exhibits the interactive installation “Solar Pink”, by the North American group Assocreation, in the sidewalks of Avenida Paulista, and the installation “Arart” in the subway stations Trianon-Masp and Consolação. Created by Japanese artists Takeshi Mukai, Kei Shiratori and Younghyo Bak, this work creates dynamics in iconic art history paintings using an app for mobile devices. The FILE 2015 exhibition, that takes place at the Art Gallery of SESI-SP, gathers artistic proposals in several forms such as interactive installations, games for multiple platforms, animations, video art, GIFs, WebGLs, web art and electronic sounds. The festival also exhibits a projection subtitled in Portuguese of the award-winning movie “Shirley – Visions of Reality”, directed by Austrian filmmaker Gustav Deutsch, a contemporary cult cinema icon. Never shown before in Brazil, the film is based on 13 paintings by American painter Edward Hopper. Launch and single presentation on June 16th, 2015, 8 PM, at SESI-SP Theater. 13 of Edward Hopper’s paintings are brought alive by the film, telling the story of a woman, whose thoughts, emotions and contemplations let us observe an era in American history. In this installation, the ribs surrounding the viewer react to the data, lighting up as results render matches with the alternating words related to the concept of fear and desire found in the RSS and web feed. When he blows on the sensor, the pattern of illumination changes, and the words on display begin to fade. The simple act of breathing becomes visible and important as a symbolic resistance to the power of the mass media. In this installation you can interact with your past self by touching a monument in the center of the room, which represents a tail of space-time. If you want to shake hands with your past self, you have to imagine that your future self wants to shake hands with you. “Solar Pink Pong” is a hybrid of street and video game. Players of this game can interact with an animated pink sunlight reflection on the street using their bodies and shadows. “Little Boxes” shows tiny people projected onto wooden boxes. Towards the giant spectator the mini crowds could hang out when no one’s around, move into a “fear area” when someone comes close, start to run, hide from a new “attack”, and escape in groups. “Swing” makes a dream of flying come true. While swinging you leave the drab monotony of everyday life behind, find a place to ease your mind and regain your strength. The use of a 3D oculus enhances this experience with virtual reality, creating a unique immersive adventure and sending you to a crafted watercolor world. By looking at a pile of rocks through a tablet or a smartphone, visitors can reveal the presence of one of them, virtually linked to the rocks. Mixing land-art, performance, and psycho-geography, Donald Abad’s installation reveals the memory of what is inanimate. “Big Beat” is an interactive, choreographic, social giant drum machine, that is also a game. Stretch out in unknown bodily positions to reach the buttons and create rhythms. Make new friends to create even funkier beats together. “Phantom Limb” provides an interaction similar to one of the main treatments to phantom limb, a phenomenon that afflicts people who have suffered amputation of limbs or organs. Just like the original mirrored box, the installation is a rectangular unit where the user inserts his arm and is urged to move it in different ways. “Futuro do Pretérito” transports us to the universe of the visitor through customized glasses. We see what he has seen and the time he used them. At the same time, a sound intervention and a device that makes him see what’s behind him act over the visitor. Numerous symbols are expressed in irregular patterns of sound through the three audio-visual installations. The sound is transformed, resulting in the image of waves sinking inside. Through these processes, this installation can be the right tool for meditation. “Border Mover” is a pneumatic mechanism that enables a 2D video image to be transferred to a 3D space. The installation explores physical and psychological borders, and deals with the contemporary individual being, who is trapped in overwhelming technology and the routine of their everyday existence, which resembles the monotony of operating machines. Large scale LCD video screens are pierced, producing cracks on the glass surfaces. The liquid crystals splash within the fragments and give the impression of organic forms trapped under light boxes. This work confronts us with a paradoxal twist: an absurd action forged in the same relentless flight of obsolescence and waste as our current consumerist media feeding frenzy. “Plink Blink” allows three participants to make collaborative music by blinking their eyes. In contrast to its quiet nature, blinking is rhythmic and a resourceful input for sound generation. “Hardwired” consists of around 18,000 LED-lights that symbolize the transfer of knowledge. Individual luminous pixels connect and then disappear. In a process of constant transformation, new patterns, interrelations and complexities emerge. “PAREDE” is a kinetic and interactive structure made from 45 mirror finished aluminium sheets which, in a chain reaction, rotate 180°. The chain reaction happens according to the visitors’ actions. Just like domino, when someone passes by one of the installation’s extremities, they trigger an action mechanism; the sheets turn, one by one, until they rotate. “BOOKWORM” is a reading-talking machine, an automaton book designed to perceive the environment and express what it sees via fragments of literature. “A Time Capsule of Life” is an interactive sculpture created from plastic bags, which form a transparent structure of cells and conduits. Connected to air tubes, the bags are pumped up depending on the movement of the audience, which becomes part of the system. Without the presence of an active spectator the sculpture falls back slowly. Supported by Mondriaan Fund. A machine that constantly combs a green tape over the floor and so creates constantly changing patterns while the green material is moving the machine in return. A constant dance between machine and material emerges. Supported by Mondriaan Fund. Collectie Voorlinden, Wassenaar. As a giant poppy flower, this piece of tarpaulin unfolds itself above the viewer to show an elegant dance of waves and curls while within this dance a violent battle emerges between gravity, friction and centrifugal forces. Supported by Mondriaan Fund. “Monomito” is a multimedia performance in which the performer crosses the public space wearing an apparatus that recognizes visual patterns of human faces, “kidnapping” them and projecting them in the mask of the performer, as well as other places in the space he crosses. “IJO” was born with the objective of reframing the place of dance and a re-appropriation of the public spaces. By positioning themselves in front of the work, the participants have a visual representation of their bodies exhibited in real time on the Fiesp building. Dance to tell who you are. “ARART” is an application that breathes life into objects. It links reality with the expressions delivered through mobile devices adding new stories and values to the real environment. This year, FILE Anima+ presents 107 short films from innovative and experimental artists who work with different techniques and approach various subjects. For the first time, FILE Anima+ offers an award: the FILE Anima+ Award. With over a hundred works submitted in different techniques, 6 animations were chosen to be awarded with the 1st, 2nd and 3rd places; and three honorable mentions. As a highlight, the festival also presents a new exhibit proposal called “Cutting Edge Animation”, with 23 animations from 13 artists that are part of the collective Aboveground Animation, an itinerant showcase of animations, videos and musical performances, and of artists from all over the world. Besides this proposal, FILE Anima+ exhibits the awarded animations by the most important animation festivals of the world through partnerships established since 2011 with Japan Media Arts Festival, Be There! Corfu Animation Festival, SICAF, SIGGRAPH, and ANIMA – Córdoba International Animation Festival. 21 ESMA – Forward, March! FILE 2015 presents a curatorship with a profile of the current video artistic production, with around sixty works from artists of more than twenty countries. The purpose is to bring forth the work of young people who seek to develop their own poetics and languages through video. FILE 2015 presents new curatorships with GIF and WebGL works. Using as a starting point photography, drawings, illustrations, and interactive animations, all of them explore and point out to original possibilities of use and artistic expression. June 16th to 18th, from 9 a.m. to 1 p.m.
June 16th and 20th, from 1 p.m. to 5 p.m.
June 20th, from 9 a.m. to 1 p.m.
June 16th and 17th, from 9 a.m. to 1 p.m.
June 19th, from 9 a.m. to 1 p.m.
June 17th and 18th, from 1 p.m. to 5 p.m.
June 20th, from 9 a.m. to 5 p.m.
June 18th and 19th, from 9 a.m. to 5 p.m.
June 16th and 17th, from 6:30 p.m. to 10 p.m.
June 16th to 19th, from 1 p.m. to 5 p.m.
June 19th, from 1 p.m. to 5 p.m.
Every day from 10 AM to 8 PM, entry permitted until 7:40 PM. Every day, with public interaction from 8 PM to 10 PM and exhibition of visual works from 10 PM to 6 AM. Avenida Paulista, 1313. Near the Trianon-Masp subway station. Group scheduling: Monday to Friday on the phone 55 11 3146 7396. Contact: Leni Arietti.